Open Streets Windsor returns Sunday, September 23rd, 2018 and the city is looking for volunteers, as well as individuals, organizations and businesses to contribute ideas and activities at hubs along the massive event route. The free community event will again run an eight-kilometre route along Sandwich Street, University Avenue West, Wyandotte Street East and Drouillard Road. To make the event a success, the city is looking for more volunteers than ever who are fun, friendly and excited about making a difference. Duties include greeting, safety monitoring and supervision of roadway barricades. In addition to providing a space for people to walk, cycle, roller blade, etc. along the route, hubs are designated for individuals, businesses and organizations to carry out activities that promote health, physical activity, arts and culture—and that’s where you come in! Activities must be free and encourage the greatest possible participation from people of all ages and abilities. If you would like to become a volunteer or a supporting activity partner, or if you’d just like to learn more about the event a planning session will take place on Thursday, June 28th, 2018 from 3pm to 7pm at the Windsor International Aquatic & Training Centre Presented. 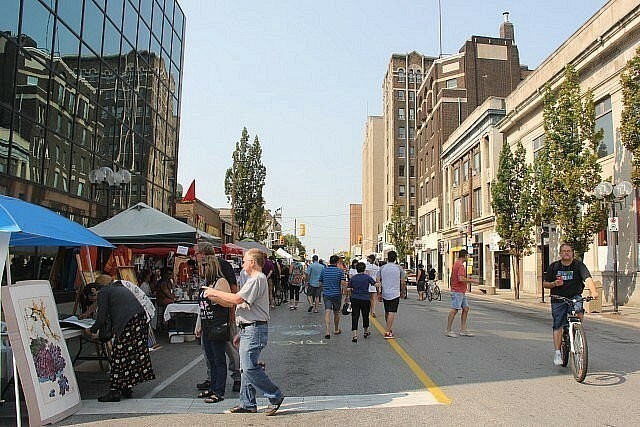 More information can be found online at www.OpenStreetsWindsor.ca.